Home / live / War....Hey! It's been a good week. It has flown by getting back Monday night from the North Carolina beach trip and leaving this afternoon for a weekend in Atlanta. Here's a little bit about our week. 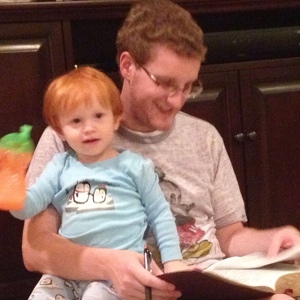 We hosted lifegroup Tuesday night and it was the first time we were all back together since baby Bethany was born. 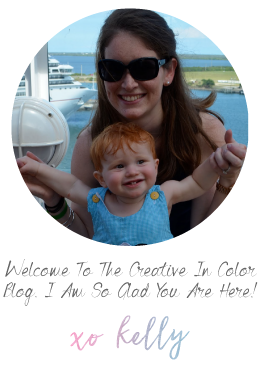 It was great to see that sweet baby (and her parents too). Perry has been sporting some orange and blue this week in honor of the beginning of the college football season. We have also been training him to say "war eagle, hey!" So far we have gotten "waaaar...hey!" Eagle is a tough word to say. 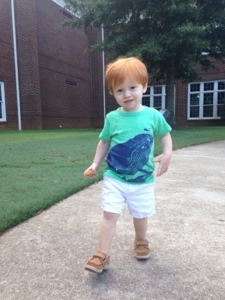 P is loving preschool. He was looking super cute and preppy on Wednesday. He looks like such a big boy! Who said dressing boys is not fun? 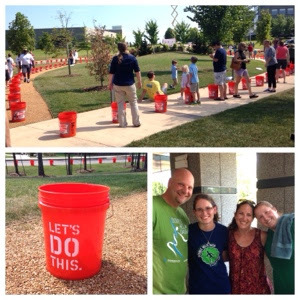 Meanwhile across town at HudsonAlpha on Wednesday, we hosted a large scale ice bucket challenge to being funds and awareness to the ALS society. Over the last month social media has been a flurry with people posting videos of themselves dumping buckets of ice water on heir head for ALS. HudsonAlpha does a lot of ALS genomic research so it was only fitting that we participate and take it up a notch. 100+ people congregated out on our helical park and one after another dumped cold-ish water on ourselves (it was hot and the ice didn't stand a chance). 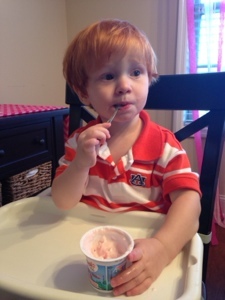 I love that this little guy is learning to be more self sufficient. 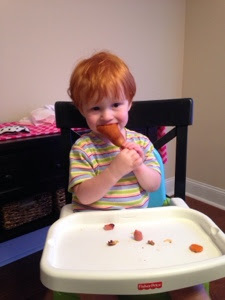 Evidence A: gnawing on a corn dog for dinner Thursday night. Thanks Granna for the reminder that it was 50 cent corn dog night at sonic. 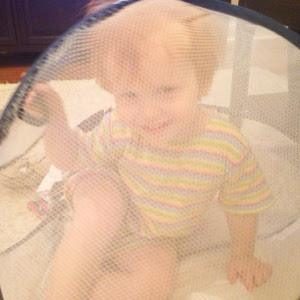 Silly boy in a laundry basket! He is not so much the best helper in folding clothes. He likes to unfold things rather than fold them. Then this afternoon we loaded up the car for a road trip to Atlanta for the weekend. We have so many fun things planned. It's going to be an awesome weekend. And it's the first weekend of college football. We will be cheering our tigers on from somewhere in Atlanta. War (Eagle) Hey!